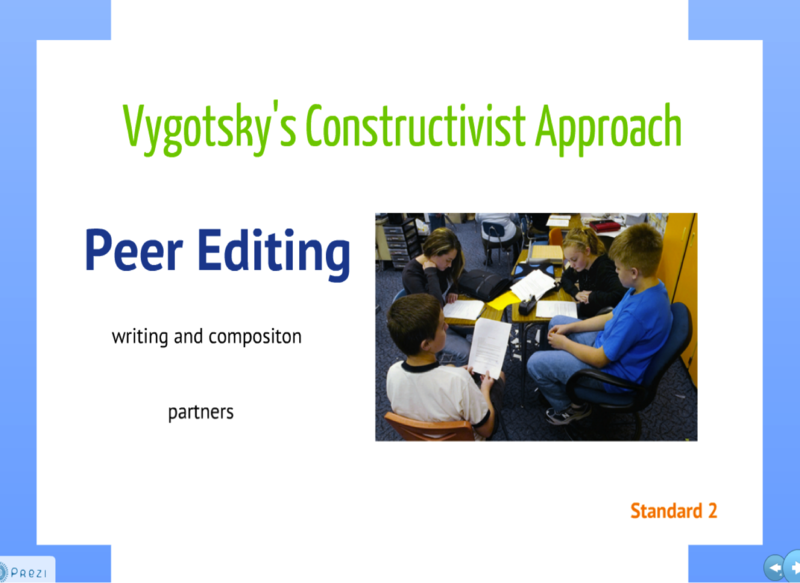 In order to incorporate Vygotsky’s theory of the Constructivist Approach, middle school educators should plan to incorporate many different activities that allow for collaboration amongst peers. Teachers should assign partners for many assignments, which will allow students to assist one another. In an English and Language Arts classroom there is a great focus on writing and composition. One activity a teachers could use frequently in his or her class is peer editing. Allowing students to read one another’s work provides them with the opportunity to share their information and learn from others. Rather than letting the students choose who will peer edit their papers, instructors must assign partners according to students’ academic achievement. Students with high marks in grammar and spelling will provide great support to those who may fall short in these areas. These students will be the “scaffolding” for those struggling with the subject material. The more-skilled students will be able to guide their counterparts through the editing stage. In addition, the students with a firm grasp on the material will require less attention during the editing stage. This practice will prove beneficial to both individuals because they will learn how to collaborate with one another and will stimulate learning through social interaction.